I had the chance to review the Thermoworks ThermaQ WIFI a few weeks back. I forgot to mention that buried deeper in my box of goodies was a Thermoworks Smoke remote meat thermometer as well! Two remote thermometers? What’s the difference and why do I need two? I have now run both through a few cooks so I feel qualified to answer those question. I love gadgets but I really appreciate simple gadgets that do their specific job very easily. I’m sick of complicated set up procedures and configurations. I really love the Thermoworks Smoke for this reason. You can’t screw this thing up, there is no setup. The receiver is automatically paired with the transmitting unit, no WIFI connection (or password) is necessary. Unlike the ThermaQ WIFI, the Smoke is “line of site”. So unless you are planning on leaving the advertised 300 foot range of the unit, it works perfectly for simple remote temperature monitoring. Don’t get my wrong, I love the ThermaQ WIFI if I need to run errands during an all day smoking session but for week night dinners of pork loins, whole chickens and the like; the Thermoworks Smoke is what I prefer to use for its simplicity. The ThermaQ setup process is easy, but it does rely on WIFI which can be sketchy at times around my house. Not the unit’s fault, but I still prefer to not have to worry about WIFI so the Smoke is perfect for around the house. This section is kind of a joke, or at least hard to stretch into a whole section for this review. Set up is literally “remove it from the box, turn it on and plug in the probes”. The hardest part was threading the lanyard through the receiving unit, but that was mainly because I was one handed due to a fishing hook accident (pro tip, use pliers when removing a 10 pound redfish from a lure with treble hooks). I chose to first try the Thermoworks Smoke while cooking a pork loin for dinner. 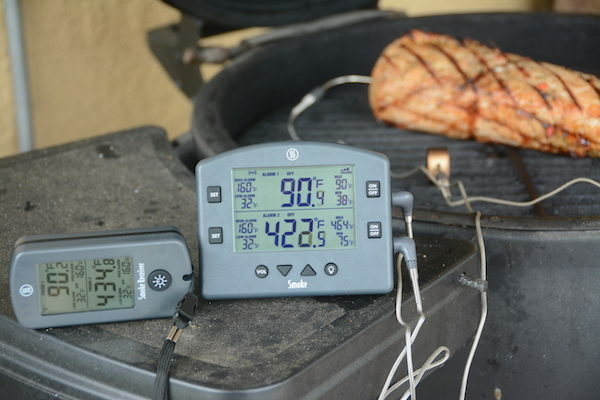 I like to cook at around 400 degrees, so I set the grill probe on the grate and went about preparing my rub and pork loin while I monitored the grill temperature as the charcoal got going. Once the grill was heated to my liking, I inserted the meat probe into the pork loin and put it on the grill. I used my Thermapen to check for accuracy throughout the cook and the Smoke was always within 3 – 5 degrees so that’s accurate enough for me to trust it moving forward. That’s what I love about Thermoworks, accuracy is a huge deal with them. If I overcook something, it isn’t their products’ fault. 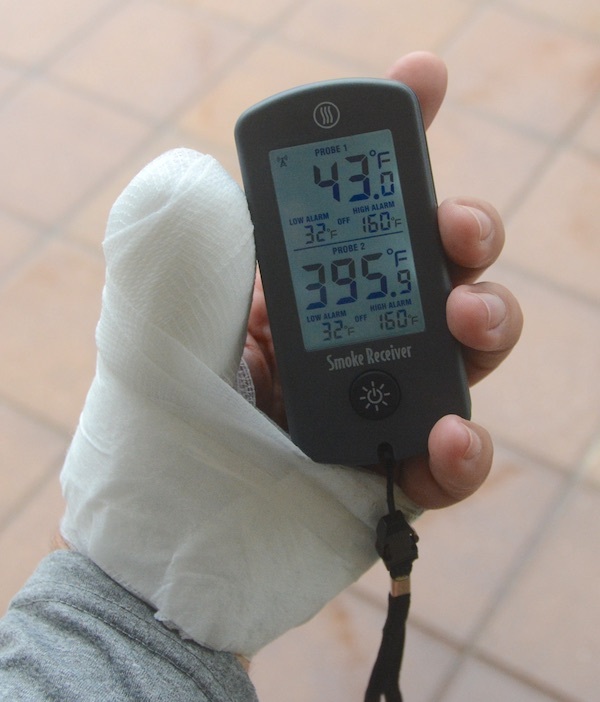 The Thermoworks Smoke has become my goto remote thermometer for most cooks now. I even use it for chicken thighs and breasts for peace of mind. I can monitor the grill and the meat from afar (well, within 300 feet afar) to make sure temps don’t go out of control. I’ll still use the ThermaQ WIFI if I need to leave the house, but that will only happen during slow and low cooking sessions.